Home school parents fully understand that basics must be mastered before students can build on that knowledge. A good analogy would be of a carpenter building a house. Until the foundation and walls are finished, a completed roof would lay on the ground, unable to support itself in the air. Since there is no need to stay with a structure imposed by the system, home school students are able to keep working on a lesson until they have learned it. There is absolutely no reason for a homeschool child to fail a class, since they have the time to master a topic before continuing further into the subject. If the students are particularly interested in a subject, they are not restrained by lack of time from going further than the material. By following a topic into other areas of interest, students gain serendipitous learning. This helps students come to enjoy learning. In the public school environment, teachers are expected to teach to a schedule and curriculum that is more or less rigidly controlled. Home school students do not have a preset schedule imposed from outside the home. They are able to take the time to understand a subject thoroughly before going to the next subject. Because of this greater freedom of time, more activities are able to be incorporated into lessons, such as field trips to museums, zoos, or historical sites. Even family vacations become part of the curriculum. When the family travels, home school students see firsthand the geography, flora and fauna, and lifestyles of the region they visit. 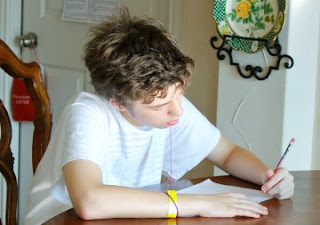 Unlike public school, the home school is free from distractions and time wasters. There are no students wandering up and down the halls distracting students in classrooms, no bells signaling it's time to pack up and start learning again somewhere else, or students disrupting class. In the more relaxed home environment, students are able to do their work at a desk, on the floor, or even sitting on the porch. When it is time to study another subject, home school students just close one book and open another. There is no time wasted walking from one class to another, waiting for everyone to get their books and papers out and ready, or playing games when the teacher is ill or has more "important" things to do. Many home school students finish in less than four hours the same amount of material, or more, than public school students cover in a full day. It has long been accepted that small classes are better than large classes, and that the very best teaching situation is one-on-one. This is not practical in public school classrooms where there are 15 to 40 students in each class; there just aren't enough teachers to go around. In the home school, teaching one-on-one is the normal operating procedure, even in families with many children. Each child receives the personal attention that is simply not possible in public schools. Parents are able to help and encourage their children, not as bystanders in the educational process, but as active participants. Peer pressure is almost unheard of in home schooling. Home schooled children are not faced with classmates who ridicule or bully, therefore they feel more secure. Their energy goes into learning, rather than survival. They do not have the constant pressure to participate in antisocial behaviors such as drinking, using drugs, or joining gangs. They learn the values held by their families to help guide them in making important decisions. There is no need to have the "right clothes or shoes" to be accepted by their peers. Their peers, other home school students, usually dress much the same way they do. Many people seem to be concerned about the socialization of home schooled children. Merriam-Webster Dictionary defines socialization as: "1: to regulate according to the theory and practice of socialism; 2: to adapt to social needs; 3: to participate actively in a social gathering." Most American home school parents do not want their children regulated according to the theory and practice of socialism. Most of the homeschool parents I know are intensely patriotic and loyal to the democratic form of government. These parents disagree with public school experts such as Myra P. Sadker and sociologists such as Talcott Parsons who believe that the public school has the both the right and the responsibility to screen and sort students, in effect deciding very early in a child's academic career whether the child will someday be a lawyer or drive a garbage truck. Home school groups and co-ops often provide the opportunities to participate actively in a social gathering. The groups have sports teams for all ages, band, choir, and many other activities, giving the students a chance to learn to cope with other children while rounding out their educations. They are often involved in national contests such as spelling bees, and many spend a great deal of time in volunteer service to their communities. They even have yearbooks and senior banquets where the kids dress up. A significant advantage of home schooling a child is the almost total lack of generational gaps. Home schooled children know their parents are interested in and care for them. Children who are home schooled tend to cope well with people older and younger than themselves, as well as with those in their own age groups. Most of homeschooled students are more self-assured and have more confidence in their abilities than public school students. They tend to be strong in their beliefs and make excellent leaders. Home school is a viable, legal option in all fifty states. That said, you need to check with your state to learn the technicalities involved. Some states are more home school friendly than others. Not everyone can, or even should, home school their children. However, for those who are motivated through religious or academic considerations to teach their children at home, the data supports their ability to do an excellent job. I have used these books and highly recommend them. Comments or questions? Let me know in the comment section below the image.